Kerry wakes up and finds Toby standing over her, apparently sleep-walking. KERRY: Joe, quickly. Wake up, it's Toby. Joe looks at him in confusion but Toby's eyes are blank and unseeing. Kerry is sitting up in the kitchen and Joe has got Toby back into bed without him waking up. They agree to get Beverly's opinion tomorrow. JOE: He doesn't talk about it. I mean, he hardly talks at all. What are we going to do? KERRY: Give him time. And love. Toby's still in shock. He can't accept that his mother's dead. We're just going to have to be there for him until he can face that fact. Joe is still desperately worried and decides to go to sit with Toby for a bit. Madge and Helen are moaning about Melanie's voice keeping them awake. They also chat about Harold running for council. Helen reckons that the council could do with some new talent. Helen observes that Madge is being very reasonable about the fountain. MADGE: What fountain are we talking about? HELEN: The Jack Ramsay Memorial Fountain!...I thought you knew. MADGE: Now let me get this straight. Are you saying that they're planning to demolish my grandfather's monument? 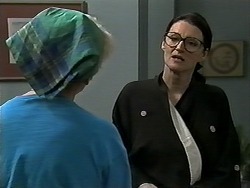 HELEN: Now, be reasonable, Madge. It's in a terrible state and potential dangerous. Young Lochy nearly had an accident there the other day and there have been complaints. MADGE: From whom?! Oh, don't tell me, your new found friend, Dorothy, the wicked witch of the West! HELEN: I'm sorry I said anything about it! Madge says that they'll touch the fountain over her dead body. 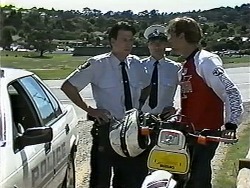 Ryan tells Todd off for riding without parental supervision and hanging out with Boof and his mates. TODD: Boof's not so bad. RYAN: Yeah, on another planet, maybe! Boof comes up and has a go at Ryan. There is nearly a fight bu Ryan walks away. Harold is home from Church and says he is going to run for council. HAROLD: What can I say, some people have greatness thrust upon them! Madge tells him that she has a platform for him - preservation and conservation of the Jack Ramsay Memorial Fountain. Harold says that it would cost the earth to repair the fountain. Madge says that she wants Harold to make the fountain one of his causes, but he says he's only one voice. Madge reckons she's going to get all the local residents to support the cause! 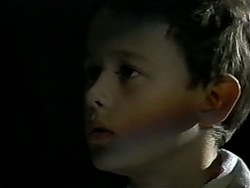 Toby creeps to the washing machine with his wet sheets and Kerry sees him coming in from the garden. He is very embarrassed, but Kerry tells him not to worry - sometimes it even happens to grown-ups. KERRY: Alright. Why don't you go and have a wash and I'll make us some breakfast. Kerry is putting the sheets in the washer when Joe comes in. She tells him what's happened and tells Joe that he's not supposed to know. Joe says he used to wet the bed before when he and Nolene split up. KERRY: The only way we're going to get through this is as a family. 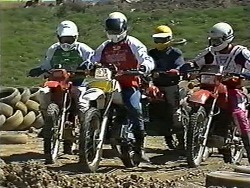 Boof and his mates corner Ryan and then start chasing him on their bikes. Ryan is forced off the track and on to the main road. He is picked up by the police who ask to see his licence. Madge has come round to have a go at Dorothy about the fountain. She claims that Dorothy is being spiteful because she had a go at Lochy for picking flowers from her garden. Dorothy rolls her eyes and says that she's only complained to the council because the fountain is unsafe. Madge reckons she's going to get the National Trust involved. DOROTHY: National Trust? Before you make a fool of yourself, I suggest you take another look at your precious fountain. As a piece of architecture, it's shoddy. As a piece of art, it's a pre-war monstrosity with no redeeming features. 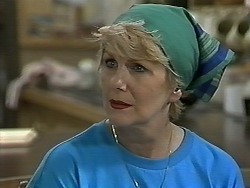 DOROTHY: And as a fragment of history, I'm sure it's a piece that Erinsborough would rather forget. I study the past, Mrs Bishop. Jack Ramsay was a man who subverted the law and used power to line his own pockets. MADGE: That's my grandfather you're talking about! DOROTHY: Not something I'd boast of. MADGE: Don't think you've heard the last of this, cos you haven't. Ryan is explaining to the police what happened. They go to talk to Boof and the others. They tell them that chasing someone amounts to assault and they could be charged for it. Ryan says that he doesn't want to press charges. The police take all their names. Toby is sitting in front of his dinner, blankly. He isn't eating anything. HAROLD: It's going to be quite a month for me this month, Toby. Did I tell you I was running for local council? Yeah! Mind you, I won't let that get in the way of the really important things...you know - Scouts, Cubs...no. yes, and we've got a big bivouac at the end of this month I could do with an experienced trooper...eh? Well, we'll talk about that later. You know, Toby...we human, we're funny creatures aren't we? I think the main reason that we miss somebody when they're gone is because we...well, we may not be able to love them so much as when they're with us. I thought a lot about that when I lost mymother. I wasn't much older than you, of course. But I still felt hurt...confused...it was as if I'd been - well, cheated, and it wasn't fair that she'd been taken away like that. Oh, I knew that she was happy and that she'd gone to a better place, but still I sort of felt left behind. See, I had to realise that...it's alright to feel sad. It's part of loving someone, you see. Once I realised that, I knew my mother would never die. Not for me. She'd always be alive, happy, well...here, in my momories. 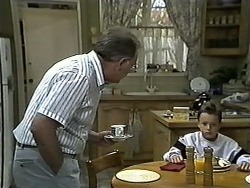 Kerry comes in and tells Toby that he doesn't have to eat his dinner if he'd not hungry. He goes silently off to his room. 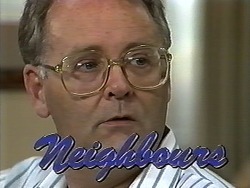 HAROLD: I get the feeling that he would love to cry. But he just doesn't know how. JOE:(coming in) Thanks for giving it a go, Harold. Joe is wondering if Toby should go to school, but Harold doesn't think it's a good idea - Toby needs time to get through all this. Todd is unhappy with Ryan about the police. 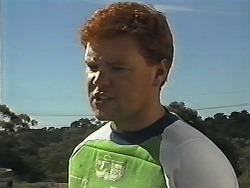 Ryan tells Todd off for hanging around with Boof at all - he's a loser and so are his mates. 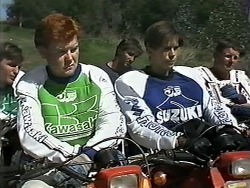 Ryan tells Todd not to be stupid - Boof and his mates will drop Todd in trouble without a second thought. 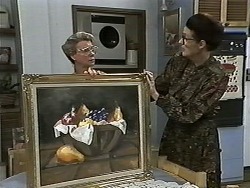 Dorothy and Helen are de-framing the hideous paintings. 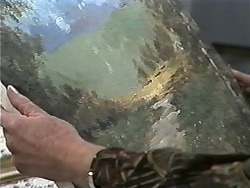 They find another painting behind the other - it's a really beautiful painting. Madge is pouting about the fountain. Harold rolls his eyes and says she's making a mountain out of a molehill. HAROLD: I mean, the street is named after Grandfather Jack, isn't that enough?! Madge says that Harold has become a philistine! HAROLD: The fountain is ugly, and of very little historical value. There, I said it. Madge is appalled but Harold says there's no point spending money on preserving rubbish. 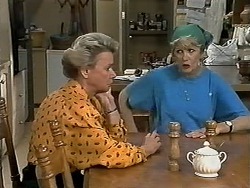 MADGE: To think I was going to support you in your campaign to get on the council. Well, you're not getting my vote! MADGE: I'll support a candidate that means what he or she says. HAROLD: You mean someone to defend that fountain? Ha, ha, I doubt it. MADGE: Alright, it'll have to be me then. MADGE: You heard. Let the voters choose. I'm running against you!